Don’t you want a bite? 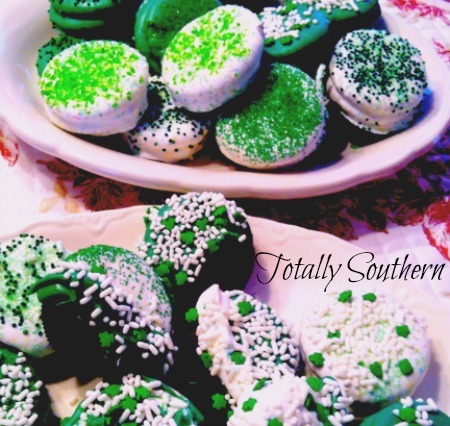 Here are a couple of quick treats to make for Saint Patrick’s Day. First, a tasty little “cookie” all covered in white chocolate with green sprinkles. Make little peanut butter sandwiches using the crackers. Cracker, then peanut butter, then topped with another cracker. Make as many as you want to cover in chocolate and set aside. Melt your chocolate in the microwave according to the package directions. If using the melting wafers, add a little Crisco (the solid kind) to help with the smoothness. Stir your chocolate well when melted. Dip the peanut butter crackers into the chocolate using a fork to help with the dipping and removing. Place on a wax paper lined cookie sheet. 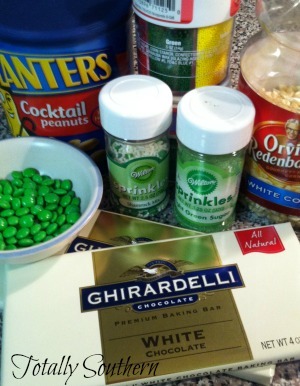 Sprinkle with your assorted green sprinkles as you remove them from the chocolate. If you wait until all of the crackers are dipped, then the sprinkles won’t stick. So, do this step quickly! Arrange on a platter for a great afternoon snack or even as dessert. Yummy peanut butter combined with sweet chocolate in a buttery cracker. What’s not to love? You can also cover Oreo Cookies in chocolate and then sprinkle with lots of cute green sprinkles. 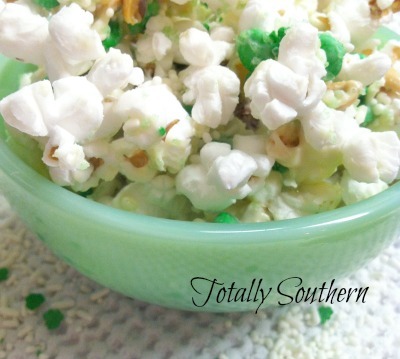 The second quick treat is also one of my favorites… Confetti Popcorn. A few years ago I found a similar “recipe” on Pinterest. You can check it out here. 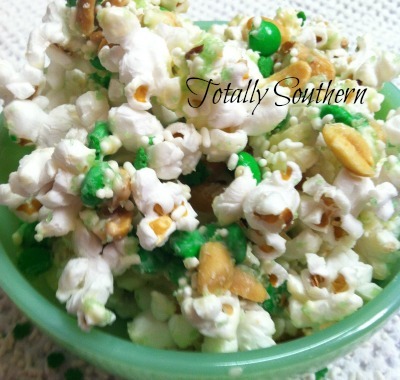 This popcorn is great for any holiday or occasion, just change the color of candies and sprinkles. 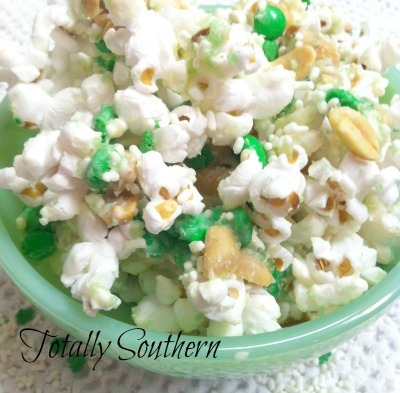 White Pop Corn (I use the “old fashioned” kind that you make in a pan on the stove. You can also use bags of white microwave popcorn). If you use the old fashioned popcorn, just follow the instructions on the jar. You will need oil and salt to make it. 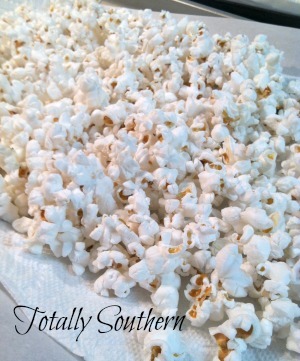 Pop your popcorn and place on a paper towel lined cookie sheet to absorb any excess oil. Melt your chocolate according to package directions. Remove paper towels from cookie sheet. 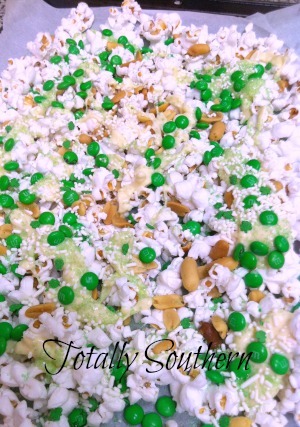 Spread the popcorn in a layer on cookie sheet and sprinkle with peanuts. Pour or spoon on the white chocolate. Toss on the chocolate candies and sprinkles. Stir with a spatula to mix well. Let the popcorn mixture cool. Once cool, place into serving bowls or store in an air tight container until ready to use. 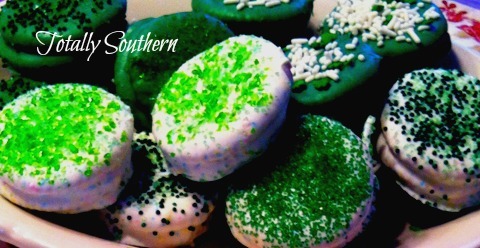 I hope you enjoy these quick treats for your Saint Patrick’s Day festivities! May you have The Luck of the Irish! As always, sweet comments are welcome!